Wedding are expensive. So, in an effort to alleviate some of the elaborate costs, we put our savvy style skills to use and found seven ways to save on a wedding dress. We’re sharing the tricks you need to know to make your dress look way more expensive. With the help of our hacks, you’ll have your wedding guests thinking you spent the majority of your budget on your gown. Scroll down to learn our hacks! Tweaking your dress to the proper fit will do wonders for the overall look. You can even save by purchasing the floor sample and splurging on the alterations. 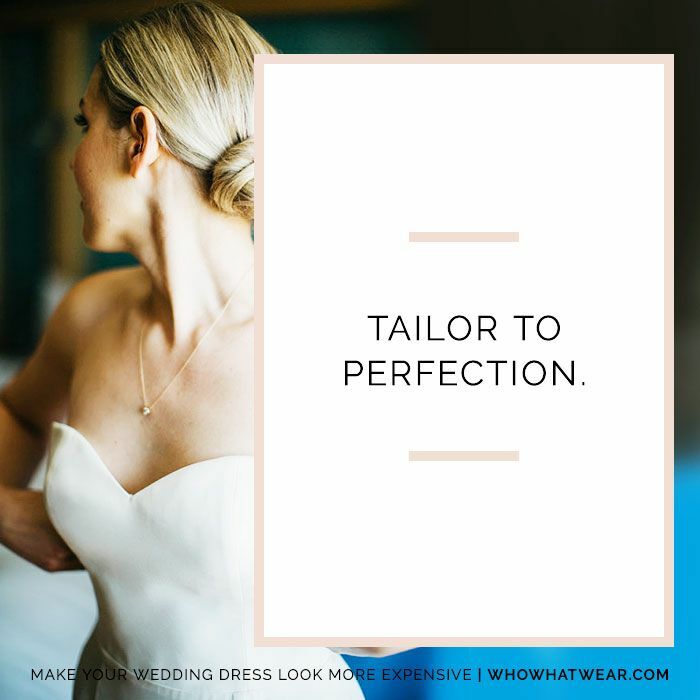 In our opinion, every bride should visit the tailor before the big day. The softer hue will lend an extremely luxe vibe, whereas a sharp white can quickly look cheap and inexpensive. Plus, anything too bright will look fluorescent or like it’s glowing in photos; a pretty cream or ivory tone photographs with much more ease. Whether it’s a simple satin sash or a belt with some subtle sparkle, adding this detail will make your dress look more expensive and accentuate your waistline, Win-win! This small addition to the back of your dress will add a majorly chic detail. If you fall in love with a dress but dislike some of the details, like a distracting bow or beaded frill, remove it entirely or replace it will a smaller, less distracting option. Think less is more. Here’s a feminine and functional tip: Add tiny straps to a strapless dress. The simple detail will keep your dress stay in place and, as a result, make you look more put together. Because there’s nothing more distracting than a bride pulling at her dress all night. This is an easy way to jazz up your bridal look without spending too much moola. Do you have any other tips for wedding dress shopping? Share with us in the comments!